My husband and I had our dear firstborn son back in October of 2010. We wanted for him to have a sibling relatively close in age, so we put it in our minds that we would like to have a baby sometime before he was three or so. A summer baby was appealing to both of us since Tim teaches middle school and would have a couple of months off available for “baby mooning.” So last fall we began trying for baby #2, and sure enough, we had a positive pregnancy test at the beginning of October 2012. My estimated due date was June 15th, 2013. 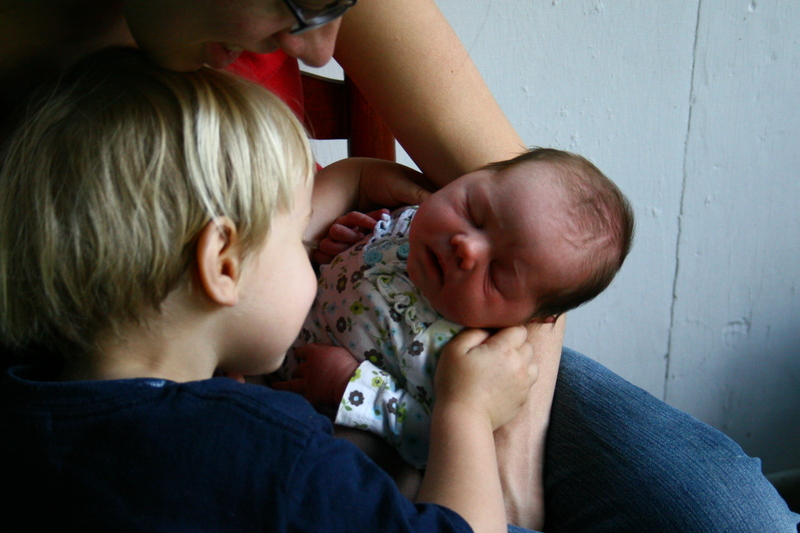 When I was first pregnant with J, we spent a long time researching our birth options and had decided on a home birth. Since we had such a lovely experience the first time, we planned on birthing our second at home as well. A brief period of financial uncertainty lead us to consider a hospital birth (since insurance would cover it), but a good tax return enabled us to pay our midwife in full and continue on with the home birth plans. The pregnancy was quite different from J’s. I was sicker at the beginning, more emotional throughout, and faced more general pregnancy-related physical challenges. I knew that both the baby and I were healthy, and that this was a blessing I should never take for granted. The most disturbing emotion was a strange unsettledness that I was having a hard time shaking. I was worried about the “what-ifs” of labor, the concerns of mothering two children and loving them both well, the fear of returning late-onset postpartum depression, mild though it may have been. I pushed off the feelings for a long time, believing in a way it was better not to pay them much attention. But they continued to resurface, sometimes overwhelmingly. In one way, I wanted to fast forward to the birth in order to just get it done with. In another way, I dreaded its coming since I was so nervous about my own mothering abilities. I realized that I was neglecting to address my fears, and more importantly, I was not taking them up in prayer. I knew it was necessary for me to take time to do this. “Be anxious for nothing, but in everything by prayer and supplication, with thanksgiving make your requests known to God; and the peace of God, which surpasses all understanding, will guard your hearts and minds through Christ Jesus.” (Philippians 4:6-7) As long as I hung onto my fears, I was not entrusting them to the One who authors life and who could give me the peace I so longed for. As I approached birth, I was reminded that it did not do me any good to worry. I needed to “seek first the kingdom of God and His righteousness,” and know that He would provide exactly what I needed (Matthew 6:25-34). I began voicing my worries to some women I trusted. Looking my fears in the face and talking them through brought both tears and great relief. I knew I was surrounded by prayer, faithful and supportive family and friends, and a skillful and compassionate birth team. All I had to do now was to rest in God’s sovereign hand and prayerfully await the onset of labor. And wait and rest I did. The last few weeks of pregnancy was filled with more peace than I had experienced the whole time. I didn’t think that the challenges or fears would never actualize, but I knew that God would give me the grace I needed to handle each moment as it came. I took lengthy hot baths, read good birth stories and long passages of Scripture, and practiced breathing and releasing all my muscles. I drank pregnancy tea and ate dates, did the birth ball hula, and practiced squatting and kegels. I tried to mentally remember what crowning felt like and welcome it. I spent one on one time with my son and reminded myself that no matter how difficult mothering can be, the joy of knowing and loving each sweet soul was immensely worth every second of it. And as my due date approached, I finally felt ready. During these last two or three weeks, I experienced light crampy contractions that would last for an hour or two here and there and then stop. I recognized all the usual pre-labor signs- diarrhea, loss of large hunks of mucus, and just feeling “off.” But the signs never went anywhere. I tried checking my own cervix, and it did seem that there was some softening and dilation occurring. As days went on, I could no longer find a distinct ring of cervix, so I decided that I didn’t really know what I was feeling and I probably was just feeling the vaginal wall. The day before my next appointment, I felt a lot of extra pressure in my bottom and assumed it was the baby “dropping.” I told myself not to get hopeful, and that I couldn’t possibly be significantly dilated. Better to expect nothing than think I had made progress, right? On June 13th, 39 weeks and 5 days, my midwife, Jen, came to my house for our regular 10:30 am appointment. (Coincidentally, it was also Jen’s birthday.) We had discussed all of my “pre-labor” and she thought it would be prudent to perform an internal exam to see what was happening. Since she lived about an hour away, she was concerned about the possibility of a precipitous labor if I was already considerably dilated. After discussing our options, Tim and I decided that if we were pleasantly surprised by my progress, we would go ahead and have Jen sweep my membranes and see if we could get labor going while she was in the area. We agreed to have Jen sweep my membranes (a rather uncomfortable procedure, though not painful), and also decided to try some herbal augmentation to see if things would get going while she was still in the area. She left me some “labor prep” herbal pills and a black & blue cohosh tincture mixed into my morning’s green smoothie. Off she went to some other appointments close to our home, leaving instructions to call her if I began contracting hard at any point. She would come back to check on me in a few hours. Jen called to check on me, but I told her that the contractions were nothing to write home about. She laughed because that was what I had been saying before- and I was obviously already dilated despite the fact that I wasn’t in pain. She said she would still come after her last appointment for the day. I had to smile as we were going to the grocery store. I thought to myself, How cool is this? Most women’s care providers don’t even know their names without looking at their charts first, and here I am having a relaxing afternoon with my midwife, running errands while I’m in light labor. We selected our items and had a memorable checkout experience with an awkward cashier. (Let’s just say that there was story telling about an internet figure who drinks bottles of Pert shampoo and other household products.) After some laughs, we headed back home. I was still having the contractions, but I barely noticed them now. I was beginning to feel doubtful that I was really in labor. I felt a little anxious about what we would do if it all stalled out. We decided we would frost and eat Jen’s birthday cake, and then she would check my cervix again. Eight centimeters and no pain to speak of? I never thought I’d be one of those women- the ladies who I thought of as the lucky ones! The fact that I had dilated this far with very mild contractions was actually a bit of a concern for us. We knew I would need good strong contractions to help push that baby out- but also to help my uterus clamp down after birth to prevent hemorrhage. 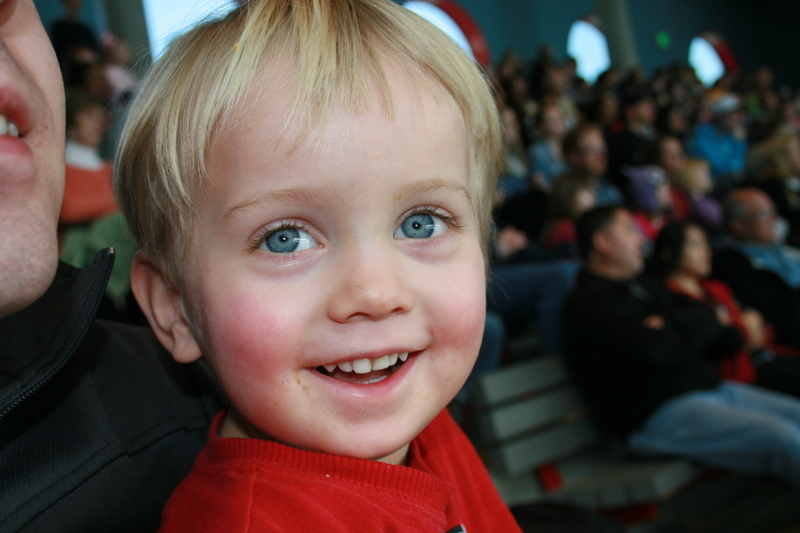 (I had experienced significant blood loss after the birth of my son. While it had never gotten out of control, we wanted to avoid a repeat if at all possible.) I agreed to homeopathic pills inserted vaginally to see if that would help move contractions along. J woke up from his afternoon nap shortly after the exam. We called my sister-in-law, Michelle, and our birth photographer, Emily, to let them know what was happening and tell them they should come in case things moved quickly. Within a half hour of the homeopathy, I began getting contractions that felt more “real.” They still seemed like early labor. I could talk through them easily, but at least they were mildly uncomfortable. Tim inflated the birth pool and began filling it; I put my pre-made freezer meal into the oven to heat up. Michelle arrived to help watch J, and Tim and I got ready to go for a walk to help progress the labor. It had been raining on and off all day, and sure enough, it began coming down harder once Tim and I went outside. No matter. I put up my hood, took Tim’s hand, and we began a brisk walk in the cool, wet evening. We remarked that this must be our labor tradition, as we had gone for a walk in the rain through transition during J’s labor as well. As we walked, we began humming and singing children’s folk songs during contractions. I knew that opening the mouth and throat through contractions helped to relax the mother and open the cervix. It seemed to be true- it made the contractions seem more manageable- much like strong pressure waves. I also helped myself through it by acting silly- I went on melodramatically about my cervix opening up like a flower to the sun and softening in the cool rain. Being ridiculous helped me to laugh and stay positive through the intensity of contractions. I think the fast walking also served as a welcome distraction. All of these were my pain management tools as we walked about a half a mile along our road under the trees. The walk was definitely effective in helping contractions become stronger. During the twenty minutes or so that we were gone, I felt like I went from early labor to transition type contractions. As we neared our return, I could feel the baby pushing down lower. I told Tim that we had to get back quickly, or I would end up having the baby on the side of the road! We returned to a welcoming house full of warmth and light and cheerful activity. Jen had prepared for the birth by pulling out supplies and monitoring the tub’s filling. Michelle had pulled the dinner out of the oven. Emily had arrived and was ready with her camera. Michelle was surprised by how much stronger my contractions were, and Jen asked me when I wanted to get into the pool. I replied that I was ready when the tub was. Jen had a quick listen to the baby, and then I went to use the bathroom before getting in the pool. As soon as I sat down on the toilet, I felt that familiar pressure of the baby getting ready to be born. One heavy contraction passed. I tried to get up and another came on quickly. I attempted rising again and a third slammed me back down. I kept humming and breathing my way through them as best as I could. They were right on top of each other now, and I knew I had to make it out of the bathroom if I wanted to avoid a toilet birth. I finally made it out of the bathroom. Jen asked me if I wanted to wear anything specific in the birth pool, and I told her yes, a sports bra and a tank top. She told me that I might want to go get that on if I wanted it. Yes, yes, I knew that, and I was trying, but I just couldn’t get a break between those contractions… Michelle offered to go get it, and I told her no- that going up the stairs would be good for me. But the stairs stopped me in my tracks again. Each step I tried to take stimulated another hard contraction, and I finally shouted at Tim to “just go!” and fetch my clothes for me. At last, I got changed and made it into the pool. Jen asked me if it felt any better in the water, and I told her that I thought maybe it did, but I remember feeling disappointed that the water wasn’t hotter. In hindsight I recognized that of course I couldn’t birth a baby into Jacuzzi water temperatures, but it was still a let-down. At this point the labor became a bit of an out-of-body experience. I kept humming with Tim through each contraction, but I knew that I would have to push soon. I thought to myself, this is why women get epidurals. Can I just wake up when it’s over? It wasn’t so much the pain that was overwhelming as the sheer intensity of it all. My hum turned into a low moan as I felt the baby begin to descend into the birth canal. Before the next contraction began I quickly told Tim, “no more song.” He said, “Okay,” and sat faithfully at the side of the pool by my head. J came in and out of the room a couple of times, wanting to show me a paper butterfly from his bug book. He seemed generally unfazed by my strange behavior, as we had prepared him in advance for the sights and sounds that accompany hard labor. I asked if we had towels for the baby once it was born. Yes, Jen had already done that. I asked if they had a garbage can for me in case I puked. No, but Tim scurried upstairs to fetch one. The doula in me was going through a mental checklist of necessities. Now I had to keep a low moan sustained through each contraction. “I’mmmmmm gonna puuuuuuuush….” I groaned as I heard myself making those familiar grunty sounds. “Okay, go ahead,” said Jen. And everyone attended me patiently and quietly. Oh, what a simultaneously glorious and dreadful feeling it is to push a baby out! There’s nothing quite as satisfying, because you know that you’re almost done and you’ll get to meet your precious new life very soon. But there’s also nothing quite as terrifying because you know there’s just no way around it. You don’t want to do it because you know it’s going to hurt badly, but if you don’t just do it you’re going to remain in this pain even longer. So you have to just buckle down and sweat and grunt and moan and let it happen. With my son, I hadn’t felt an urge to push until the very end. And with this baby, I felt the urge overtaking me without my consent. It was like a freight train, like throwing up-only throwing down. There was a sudden sharp pop and gush as my water broke. This was much less pleasant than I remembered it. It wasn’t long before I realized that Tim was in the pool with me. It must be close or he wouldn’t be in here yet. Jen told me gently to slow down. And much sooner than I expected, I felt that surreal stretch as the baby crowned- I held it there for just a moment- and oh! The head was out! “Oh, that’s SO much better!” I exclaimed. Jen and Tim remarked that there was a lot of hair. Suddenly there was an unexpected sharp pain. “Whoa!” cried Jen and Tim together. “That’s a hand!” added Jen. It turns out that pain was my baby trying to “swim” its way out with a nuchal hand by its face. And suddenly Jen was lifting me up onto my hands and knees, saying, “Okay, let’s get you out of the water.” I mentally jumped to a shoulder dystocia diagnosis, but then just as quickly as I got up out of the water the baby slid out the rest of the way. (It turns out the baby was just about to try to breathe underwater, so that’s why Jen lifted me up. Phew, no major obstetrical emergencies here!) She was born at 7:12 p.m., and I had only pushed for 12 minutes. I was eager to see this baby, so I sat back against the pool wall as quickly as I could. Tim and Jen brought the child to my chest and covered it with a towel. I admired our new little life, stroking its hair, rubbing in the vernix, quietly saying, “Hello, baby, you’re beautiful.” Tim leaned over my shoulder and gazed into those bright blue-grey eyes and smiled. “What is your baby, dad?” Jen asked. We both realized that in the joy of meeting our child, we forgot to check the gender! Tim peeked up under the towel and announced that it was a girl! She was still and calm and alert. She had only let out one little cry when she was lifted out of the water to be put on my chest. I was concerned about whether or not she was okay because she wasn’t crying, but Jen assured me that her breathing, heart rate, and color were perfect. She told us that water babies are often calm and quiet when they are born. J came trotting in, followed by Michelle. (She had been watching him and playing with him in the living room.) He came up to Tim and the two of them shared a great big hug. We showed him his sister, and told him that the baby had come out and it was a little girl! He approached cautiously and looked at her coolly from across the pool. We didn’t force him to come closer- we figured he would do that in his own time. He seemed generally happy enough, however, and went back to playing as we continued to greet our little one. Our baby girl began rooting, so I took off my tank top and tried to help her find the breast. She latched quickly and knew just what to do! As she was nursing, we watched for any bleeding and checked on the cord. Michelle began calling family members to share the good news. Probably about 15- 20 minutes after birth, the cord had completely stopped pulsing. We invited J to help cut the cord (this was something we had talked about before the birth). At first he was excited- “With scissors?” he asked. Then when he saw that he had to come up close to the pool and his baby sister to use them, he said, “No thank you!” We laughed and told him he didn’t have to help, and Tim physically separated baby and mama for the first time with a snip. Thankfully, the placenta came out with no problems, and I lost significantly less blood than I had with J! (I had lost about 900 ccs with him, and only 300 with this baby. 500 ccs is about average for a vaginal birth.) Tim took our baby girl while Jen helped me get to the shower to clean up. Soon, our new family was snuggled on the roll-out mattress we had brought downstairs for the birth. 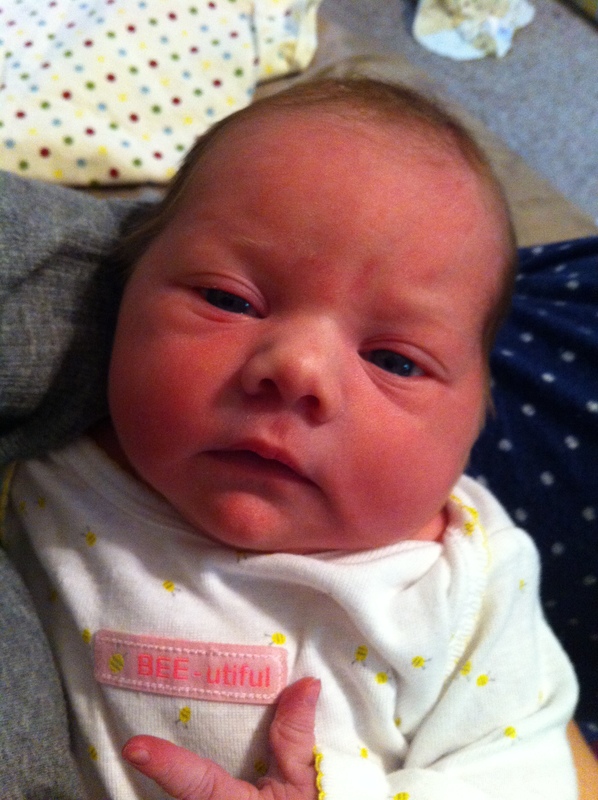 Jen performed a full newborn exam and pronounced our little girl 8 lbs., 9 oz. and 20.5” long! She had a 14” head circumference, just like her brother. I continued nursing her skin to skin under a blanket while Jen went over postpartum information with us. Afterwards, Tim helped to dress the baby and I in comfortable pajamas. James wanted to have his little sister laid on his belly so he could hold her. He was finally smiling at her and wanting to see her- and he hasn’t stopped since! After warm hugs and thank you’s all around, Michelle, Jen, and Emily made their separate ways home. Tim and I talked, and we confirmed our name choice for our little girl- I will call her V for the sake of privacy on the blog. My family came shortly thereafter, and got to meet their new granddaughter- as well as help put J to bed! Unfortunately, Tim’s parents were on vacation with West coast family at the time, but they came in to meet her as soon as they arrived home a couple of days later. As we reflected on the birth, we were amazed by how different it had been from J’s. His was a steady 14 hours of labor, but V’s was only about 8 hours total. Less than two hours of that had any pain, and only about a half hour at the end was truly difficult. I don’t entirely know why this was (though I have my theories), but I’m very thankful for the experience of an almost pain-free labor. V has been a true joy to us. We are enjoying getting to know her little personality and learning more about her each day. I am reminded by her birth and life so far that time does go so quickly, and that it is most important to soak up every minute with your children and fill each day with love for them. Before I know it, years will fly by, and they will be grown and gone. If anything, our daughter’s life has increased my love for both her and J deeply. I am grateful for my wonderful midwife who cared for me physically and personally during this pregnancy and birth. I am grateful for an excellent birth team who came just at the right time and was so helpful to us. I am grateful for a loving and supportive husband- I could never fulfill my role as wife and mother without his patient and gracious help. I am grateful for my two sweet children, who we love more than the world. We are so, so blessed in every way. Praise God for his gracious gifts! I am working on typing out her entire birth story, but in the meantime, I thought I would share some things I learned from experiencing labor and birth at home for the second time. These are in no particular order of importance. Here it goes! 1) It’s really important to trust your care provider! This came out really strongly to me during this labor. As you’ll read once I publish the birth story, we made use of several herbal concoctions to kick start and strengthen this labor. I’ll be honest- as much as I’ve researched pitocin, epidurals, and c-sections, I really don’t know a whole lot about black and blue cohosh and other natural inducers/augmenters. But because I feel very comfortable with my midwife and because I know we are on the same page regarding birth philosophy, I felt comfortable saying yes to her suggestions without going and Googling it during labor. More than ever, I am convinced that in most cases, birth works. As Ina May Gaskin is famously quoted, “your body is not a lemon.” Yes, there are medical circumstances and health conditions that can change this. Yes, there can be true emergencies. Yes, sometimes you should make use of natural tricks or medical tools to help your labor in some way. Please don’t think I am ignoring these situations. But in the grand majority of cases, when birth and the laboring mother are left well enough alone and relieved of artificial restrictions, it is simple (albeit challenging at times). Your uterus will work, your cervix will open, and the baby will descend and be born. 3) Your mental attitude towards birth is just as important (or even more so!) than your physical preparation. Deciding to surrender to the birth process and releasing your fears can be even more effective than training your body as a marathon runner through your pregnancy. Yes, physical preparation is important and can help you to deal with the rigors of birthing. However, if you are mentally resistant, you can actually make the process slower, more difficult, or more painful. Adrenaline can slow or stop contractions. Fear and tension can literally close the cervix and hold up the opening that needs to happen for the baby to be born. And fighting the contractions is fighting the work the uterus needs to do, making each one more painful and difficult. I’ve found that in both my two labors, when I decide to welcome the contractions as a sign that I am getting closer to meeting my baby, they become easier. When I decide to joke about them, or fake smile, or be silly just to distract myself, I am able to relax more and deal with each wave as it comes. I truly believe that accepting the birth process- rather than resisting it with misery- is probably the most effective secret to getting through a natural labor. 4) As goes the mouth, so goes the cervix! I read Ina May’s Guide to Childbirth for the first time this pregnancy. (What? I’ve been a birth junkie for this long and haven’t read it yet?!? I know, it’s weird, but at least I finally got to it.) While I don’t endorse everything she says, I felt like I learned a lot from reading it. She talks about law of the sphincter in her book- that sphincters don’t work on command, that they are tied into how a person is feeling, and that they work with each other. She mentioned how keeping your mouth and throat open and relaxed helps to open your cervix as well. I took this to heart and tried singing through contractions this time- and it made SUCH a difference!!! I felt so much more relaxed than I did during my first labor, and it was much easier to deal with the intensity of each wave. I felt like I honestly could call contractions “pressure waves” for a lot of it. I also made use of low moaning vocalization during pushing, and it really helped me to get through it. I think it was much easier than when I was trying to hold my breath and push out my son. 5) Labors can be completely different. No false starts. I woke up to a clear, established pattern of early labor. Slow, steady contractions that gradually increased in frequency, length, and intensity. Less than 8 hours total on the day of birth, and less than 2 hours with any pain. Lots of “false starts.” I got bouts of crampy contractions for an hour or two at a time over weeks. Turns out I dilated to 5 cm before I ever started “real labor,” so I guess they weren’t so false. What have you learned from your different labors? Can you relate? Looking forward to sharing more and hearing back from you! Some people like to rent actual birth pools for a set time frame from their midwife, doula, or a birth pool rental company. While this definitely has its advantages, there are many of us who like to go the less expensive route and purchase a kiddie pool to birth in. 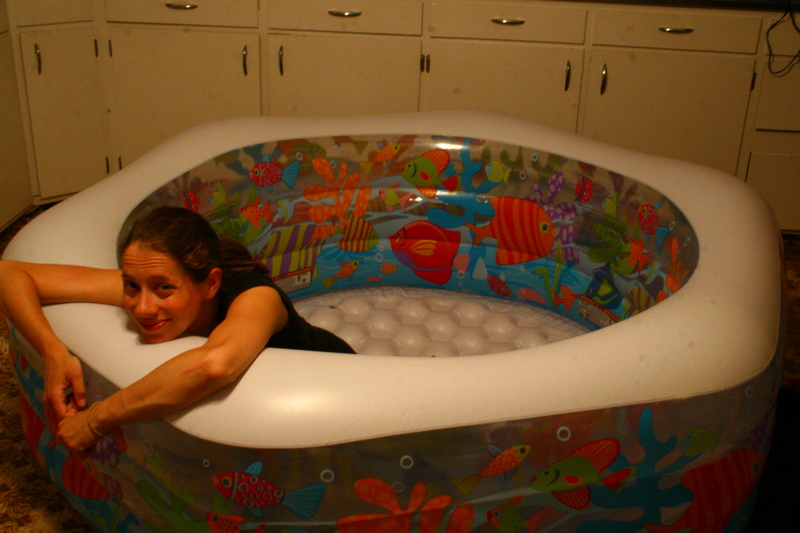 I purchased this pool from Amazon for $29.55 for birthing my second baby. 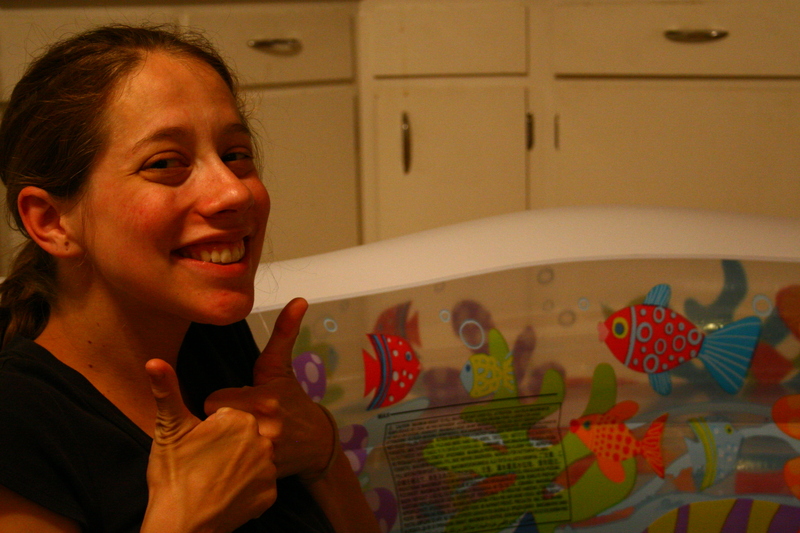 So far, it looks like it will meet my needs very well, and it has really great reviews from other home birthers. So what should you look for in a kiddie pool when you want to use it as a birth pool? The pool must be deep enough that the water will cover your entire abdomen. If it’s not, that negates one of the main points of having a water birth- helping that uterus relax into its work and bringing more pain relief during contractions! My pool is 24” deep, and that seems sufficient for me to sink down in comfortably. Make sure that the pool is large enough that you can stretch out to your liking. In mine, I can sit against one wall and stretch my legs out all the way with room to spare. The walls must be strong & thick enough to support my weight leaning against them- and remember that your husband, midwife, or doula may be leaning against them at some point too. You want to be able to lean into it during a contraction comfortably. The last thing you want is to lean against a pool wall and start spilling your water over the edge! Testing out the wall strength of my birth pool. Your birth pool must be comfortable! One thing I really like about mine is that the bottom inflates. It adds a nice layer of padding when I sit or kneel in it. Consider also softness of the walls- I much prefer thick inflatable walls over the stiff walls held in place by water weight. I just think it’s cushier. This may be more important for some than others. Some may prefer a calm, plain pool in soothing blue or green. My pool has colorful fish & seaweed all over it! While it might be nice to keep things a little tamer, I’m not worried about the design becoming too much of a distraction during labor for me. 😉 Still though, if looks matter to you, shop for a different pool that will help you stay in your zone a little better! Here I sit at 37 weeks and 3 days- big bellied and tight-skinned, hula-ing on my birth ball, having to pee, and grateful for a sleeping toddler. Today, I am grateful to be full term with a baby safely growing in my belly. I am also grateful that my discomforts are relatively few. They are mostly limited to heartburn, hemorrhoids, and the natural challenges of carrying an extra load around. 🙂 The reminder that both I and the baby are healthy is often enough to dismiss the various complaints that come creeping into my mi nd. The baby is beginning to slow down as he/she is running out of room in its home. (Don’t worry, still plenty of movement- just not as boisterous as before.) 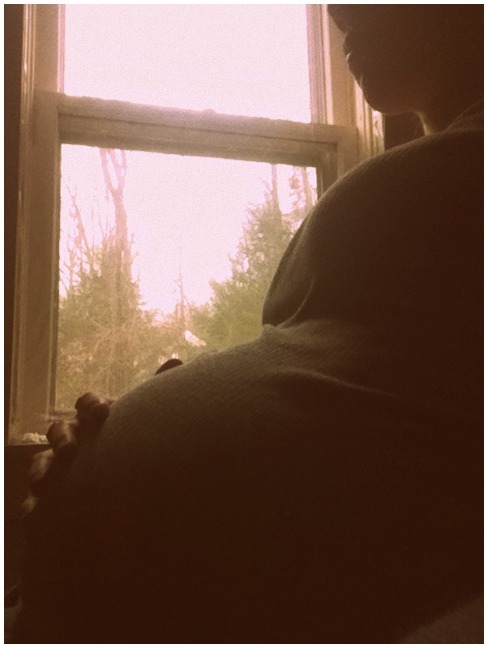 I pass the evening hour in bed belly-watching, observing the rolls and juts that disturb my taut baby bump. I remember doing this with my son, but now I know him. It seems so different somehow, to see a baby on the inside instead of the outside. I wonder who this second little one will be? The baby is completely posterior now, so I’m trying to coax him/her to turn around to ease the labor process. So far, this little free spirit has not obliged. Hopefully this will change by the time Labor Day arrives. I’m happy to be experiencing lots of strong Braxton-Hicks, with the occasional crampy bouts of pre-labor warm up. They are reminding me to breathe, to release and relax, to soften my brow and jaw- you know, all those good things I repeat to my clients during a birth. They really are good practice, even if they’re not as intense as the real thing. I’m feeling much more at peace with both the approaching birth and the prospect of mothering another child. I came to the realization that I was allowing my fears to rule me, instead of trusting that God would provide the grace to deal with each situation as it comes. As for now, I am trying to be regular in Scripture reading & prayer, and to begin seriously immersing myself in birth preparation while remembering that only God knows how all of this will play out. And I must trust Him in it- not my own strength or knowledge. This passage popped into my mind the other day as I was thinking about surrendering my worries. I don’t think it is out of context to assume that it could apply to physical needs in birth and mothering just as much as the given examples of food and clothing. I hope it is just as helpful to some of you expectant mamas as it was to me. 25 “Therefore I tell you, do not worry about your life, what you will eat or drink; or about your body, what you will wear. Is not life more than food, and the body more than clothes? 26Look at the birds of the air; they do not sow or reap or store away in barns, and yet your heavenly Father feeds them. Are you not much more valuable than they? 27 Can any one of you by worrying add a single hour to your life? Matthew 6:25-34, copied from Bible Gateway. But instead, I feel that I have become a little more quiet about it all. This has been a hard pregnancy for me- compared to my son, anyway. Way pukier at first, raging hormones, far more emotional, more frustrations with physical limitations, and a much more difficult time with exercising self-control. I find that I’m much more nervous this time. Will I be able to birth naturally again? Will I lose it in labor? Will the baby be born safely? Will I keep calm? Have I prepared enough? Will I remember how to push? And if I need surgery for some reason, what will that be like? Will I cry with joy when I meet the child, or just feel relief that it’s over? And then… once the birth is done… Will I ever sleep again? Can I deal with the exhaustion this time? How do I get into real life once my husband returns to work? How will I go grocery shopping? How will I get them both safely from the parking lot to the store? Clean the house? Get exercise? Bathe? Can I possibly do the stay-at home-mom thing successfully? Will I be able to mother two children? Will I give them both enough time? How will my son’s life change? Will J like helping Mama with baby-care, or will he resent the creature that took away much of his mother’s attention? Will I have the chance to give my baby the same love and attention I gave my first? Can I teach them & love them well, bear with them and show them patience and grace daily? The list goes on and on… More “what ifs” loom over me than last time, more fear. But there’s also anticipation. Who will this baby be? 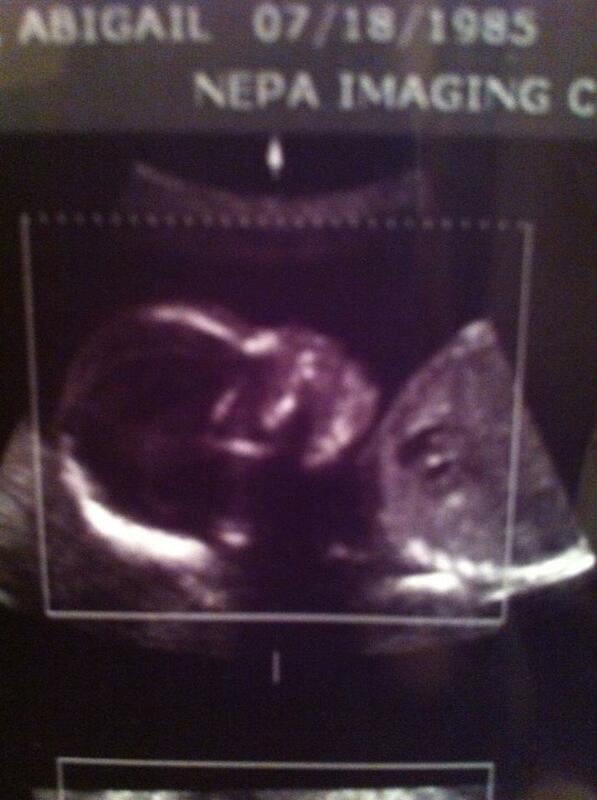 Will it be a brother or sister? What will we name the baby? Will he or she look like Dada or Mama or Big Brother? What will J think of the baby? How will the children interact? What kind of adventures will we have together? And, by the grace of God, there’s hope… Hopes that I will make it through, that I won’t feel discouraged 100% of the time, that I will maintain sanity. That millions of mothers before me have managed with far more than two children, and I will learn to manage as well. That everyone says that you are indeed able to love all of your children with just as much fervor as you loved your first. That other women have had the same fears as I. And finally, I have certain knowledge that this baby has been made perfectly by his or her Creator. He or she will come in the right timing, and we will adjust to being a family of four. I know that God will give me the grace I need to love and serve my family well- and there will be joy. Joy inexpressible at meeting this new little life and welcoming him or her into our family with open arms. The Professional Doula: Maintain Your Role! A doula is a non-medical, trained labor assistant who provides physical, emotional, and informational support to families before, during and after childbirth. You may have your own variant on this definition, but one thing that almost everyone unanimously agrees on is that a doula is not a medical caregiver (unless she is a medical caregiver already who is simply acting as a doula at the time). And yet, it seems that far too many doulas have a very difficult time restraining themselves when it comes to giving medical opinions, “cheating” at births by sneaking in food, etc., and other “infringements” on the non-medical restriction on our job. So how do you avoid the temptation and stay within your realm? 1) Give women information- not advice. If we really do believe that we stand behind evidence based care, then wouldn’t it make sense to let that evidence speak for itself? Give women resources and information to inspire them to do their own research. 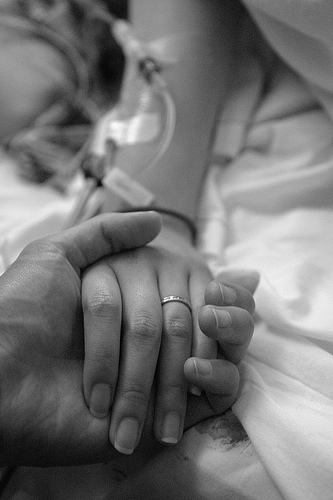 Always encourage them to come to an informed decision together with their caregivers. 2) Don’t argue with a doctor during a birth. Ask questions instead. As I said in Part 2 of this series, you need to keep your cool during a birth, even if you are in direct disagreement with a doctor. Phrase your disagreement as a question. For example, instead of: “This mother doesn’t need pitocin! Her water has only been broken for an hour,” try something like, “How long after the waters are broken does the risk of infection increase dramatically?” Even if you already know the answer, starting with a question opens the doors to suggesting that the parents and doctor (not you!) can perhaps come to a decision on how long they feel comfortable waiting before beginning pitocin. 3) Learn policies & ask questions about them beforehand. Don’t be the one to break them. Your job during a birth is to provide informational, physical, and emotional support to the mother. It is not to disregard the hospital policies that the birthing family has already agreed to by choosing to birth there. Of course, you can encourage the families to ask for exceptions to the rules, but don’t blow them off. You don’t have the training, the authority, or in most cases, the financial resources to take on this sort of liability during a birth. Remember, I am all for helping to change the face of birth in America. However, this should be done outside of your role as a doula through various methods of advocacy. When you are a doula, stick to the support you should be giving the family to ensure a job well done from all perspectives. How do you maintain your role during a birth? What suggestions would you add to this list? How do you walk the fine line of doula and birth advocate? Far too often I have overheard hospital staff talking about “the nerve” of other doulas, or listened to doctors talking about doulas getting in the way. Don’t be that doula! It’s still possible to serve the mother well while also cooperating with the staff. Here are some quick tips to having good etiquette in L& D.
1) Introduce Yourself. You are aiming to form pleasant relationships with the staff for the duration of the mother’s labor. Be friendly. Act professionally. Don’t be a standoff. 2) Ask questions. Show genuine interest in the staff & their activities. Make conversation as appropriate- obviously remembering that the mother is your first priority. Ask them how long they’ve been at this hospital. Ask if they have children. Ask if the day was busy for them. You’d be surprised how earnest and pleasant small talk can soften staff members that have a poor preconception of doulas. Better yet, ask the nurses when you first arrive if they mind if you grab what you need as you need it. Doing so ensures that you won’t be stuck in a hard place when the mother is in transition and needs you there almost constantly. 4) Think ahead. For that matter, try to ask a little bit ahead of time about as much as possible. It helps keep stress levels down and leaves everyone feeling prepared. For example, try to gently remind the staff about the couple’s desire for delayed cord clamping in between pushes, rather than right as the baby is being born. I understand there is a disagreement over [such and such a procedure]. When the couple and I spoke prenatally, I know they were hoping for [such and such an alternative]. Would you be willing to present your concerns with the couple and discuss possible options with them? (Provided this is not an emergency, of course.) Perhaps a compromise can be reached. Thank you for your understanding. I know this may not be your standard protocol, but as long as mom and baby are both healthy, I know they would really appreciate your flexibility in this matter. Maintaining your professionalism will help your client’s case, not hurt it. And it will help you to develop rapport at the hospital while you’re at it. They won’t want you near the doctor’s instrument table during pushing. Make sure you are not in the way. If the baby needs resuscitation, you will not be allowed to hover over the baby until he or she is stable. Respect this. If there is a true emergency, staff may need to move quickly. Step back and allow them to do so. 7) Say thank you. The hospital staff works very hard for a lot of women. They are usually on 12 hour shifts, on their feet for much of it, and are often being snapped at by stressed families. Many times they are left un-thanked for their work. Even if you weren’t particularly fond of a particular nurse or doctor, make sure you tell them thank you for their hard work! They deserve it! Okay, experienced doulas… what have you learned over your time working in hospitals? Share your wisdom in the comments section! Breastfeeding Expenses are Tax Write-Offs! Choices in Childbirth- Before You Write Your Birth Plan!